We all know an avid traveller who's constantly on the go. And whether it's to attend fashion weeks around the world, travelling for business or simply seeking their next big adventure, they always hit the road in style. For the intrepid explorer, this classic hat made from sheared rabbit felt with a tone-on-tone gros grain ribbon, and lined with "Brides de Gala Love" printed silk twill is the ultimate accessory for adventuring in style. Fendi was the first luxury brand within the LVMH group to collaborate with Rimowa, and they certainly didn't disappoint. It's the ultimate statement piece for jetsetting fashionistas. A thoughtful gift for someone you know who's always on the go, this high-end piece of German engineering is made from Rimowa's unique aluminum-magnesium alloy with the supremely lightweight quality of polycarbonate, and is designed for a lifetime of purposeful travel. These soft leather sneakers by Ralph Lauren were certainly made for walking. Because sometimes, the generic eye mask from in the airline toiletries kit just won't cut it. For the friend who loves to be that little bit extra, this gift ticks all the boxes. This monogram pouch holds an elegant pack of Louis Vuitton playing cards. It features a contrasting lining for a playful look. Don't be fooled by its size - this versatile cosmetic case unfolds to offers three transparent interior compartments and a detachable nylon pouch for smaller items. Bringing an entire stash of make-up and brushes on holiday just isn't realistic. This clever set offers all the essentials your make-up loving friend needs for a quick getaway. Containing the Pen+ Ellipse smart pen and a Large Ruled Paper Tablet with special Ncoded paper, together with the Moleskine Notes App, these smart tools allow handwritten notes and thoughts to travel off the page and onto the screen in real time. It's amazing what YSL have managed to pack into this handy palette, which allows you to do everything from highlight your cheeks, sculpt and dress the eyes with subtle metallics or cream eyeshadow for a graphic intensity. It's the ultimate travel companion for beauty addicts. Teaming up with Tom Dixon, Native Union takes inspiration from vintage analogue equipment for its latest collection. This handy lightning charging cable is crafted from durable stainless steel, and tapers into a droplet-shaped cone to keep things neat and tidy. It's important to stay fresh, even when on the road. This festive gift set includes a Rose Face Mask, Rose Floral Toner, Rose Deep Hydration Face Cream and Sugar Rosé Tinted Lip Treatment—all under 100 mls for carry-on convenience. The world’s first ever polycarbonate suitcase, this travel essential comes in an array of colours available in a matte or gloss finish. Survive in style with this key accessory from Kim Jones’s last show for the House. It offers a trendy play on functionality, with four practical items that can all be attached using snap hooks. A stunning gift for vintage lovers, this classic Louis Vuitton hat box in Monogram canvas can be used for more than just hats—this statement piece can be used as a chic luggage piece or as decoration for the home. Because there's no bigger buzzkill than trying to capture every moment of your adventure while worrying that your phone is going to die. For the serial Instagrammer, this gift can't be topped. 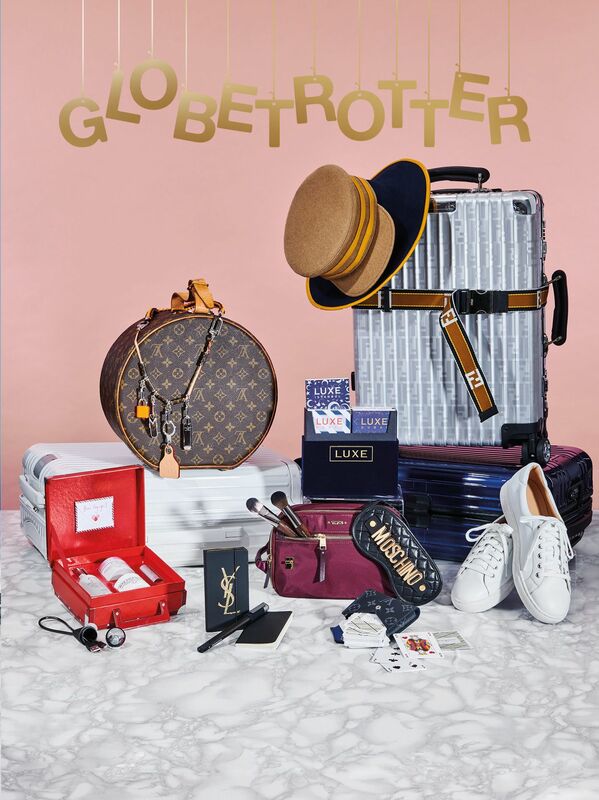 For the discerning traveller, Luxe City Guides present only the best places to sleep, eat, shop and play around the world. The best part about this set? You can personally select any eight city guides to suit the lucky person on the receiving end of this gift. These top-of-the-line wireless noise-cancelling headphones by Bang & Olufsen are perfect for blocking out screaming babies on flights and long walks exploring new cities. Didn't you hear? Polaroids are back in a big way. Know someone who has trouble sleeping on planes? This This black lambskin travel neck pillow, with an adjustable fit and button detailing, will fix that right up.